Count Rochambeau (1725-1807) was a French general who commanded France’s land forces in the United States in the last three years of the Revolutionary War. Born Jean-Baptiste Vimeur in central France, he received a Jesuit education before embarking on a military career. Vimeur served with distinction in the War of the Austrian Succession and the Seven Years’ War, reaching the rank of colonel. In 1780 Rochambeau was promoted to lieutenant general, given command of a 5,000 strong army and sent to North America. The French contingent arrived in July 1780 and disembarked at Newport, Rhode Island, before marching south to link up with the Continental Army. The hallmarks of Rochambeau’s American campaign were good relations and cooperation with George Washington. Despite outranking Washington and possessing more military experience, Rochambeau placed himself at the disposal of the American commander. The two men did not always see eye to eye on strategy but they communicated effectively and managed to coordinate their efforts. This collaboration was most visible at the siege of Yorktown (September-October 1781), when French and American ground forces, back by the French navy, forced the surrender of British forces under Lord Cornwallis. Rochambeau became a hero both in America and in his home country. 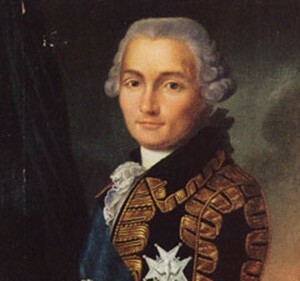 After his return to France, he became involved in the French Revolution, supporting political reform and leading military action in the northern provinces. He was imprisoned during the Reign of Terror but escaped execution.